You are currently browsing the category archive for the ‘art tips’ category. i forgot that i already scheduled a blog post for today so this is #2… ah well. 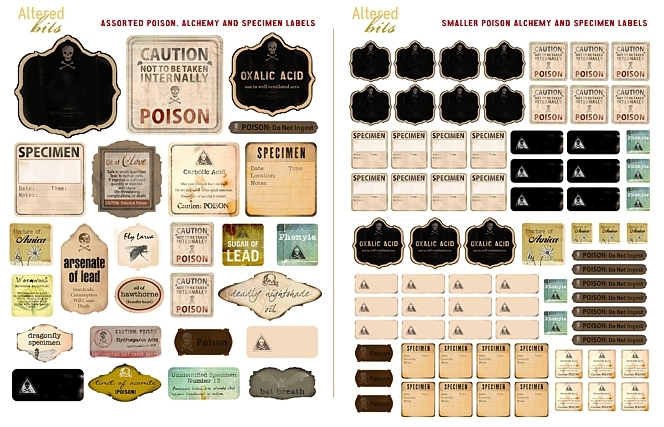 do you want to know how i create some of the aforementioned poison, alchemy and specimen labels i use in a lot of my assemblages and books? then read on! a bottle of any sort, filled with your specimen(s), or whatever you’re using (there are usually lots of little bottles on the Altered Bits site). some sort of scraper  can be a carving tool, a super-sharp pencil, a thick needle, an awl, etc. once your bottle is filled and corked (or capped if that’s what you’d doing), melt some beeswax. when thoroughly melted, dip the top of your bottle into the wax to cover it, and let it cool. keep dipping the top into the wax and let it solidify between dips until you feel it’s built up enough. i typically dip about four or five times for small bottles, more for larger. Set aside and let it dry/harden for about ten minutes. with your carving tool (or needle or whatever you’ve opted to use), carve some random scratch marks into the wax. pierce it, puncture it, and carve it to give it an old or aged look. remove all little waxy remnants. now whip out your paint and paintbrush. paint it all over the wax, taking extra care to get it into the grooves and divots in the wax. now wipe the paint off of the smooth parts of wax – the paint will stay pooled in the scratches, cracks and divots and look really quite cool. you can find a PDF tutorial of this here, complete with at least one typo (scroll to the bottom of the page): http://alteredbits.com/art-tutorials.php i’ll actually be adding a couple more “waxen” tutorials (waxen book and waxen dolls) in the coming months as well as recipes for natural dyes, assemblage projects and other fun stuff. seth at the altered page has begun his multiple secret sunday survey sharings on his blog. at some point today he will be featuring a handful of artists and sharing some of their secret art techniques. i do believe that i will be one of the featured artists this week too. 🙂 can’t wait to check it out (haven’t peeked yet today)! these little sheepies matched the print in my piece. thankfully that was one of the bottom layers so you can’t really see it anymore. so, if you use baby wipes and don’t want cute little creatures popping up into your paintings, you may want to go with a non-quilted brand. Enter your email address to subscribe to the Altered Bits Blog and receive notifications of new posts via email.